The U.S. History I CLEP exam covers the nation’s history from early colonization through and including the post-Civil War Reconstruction. 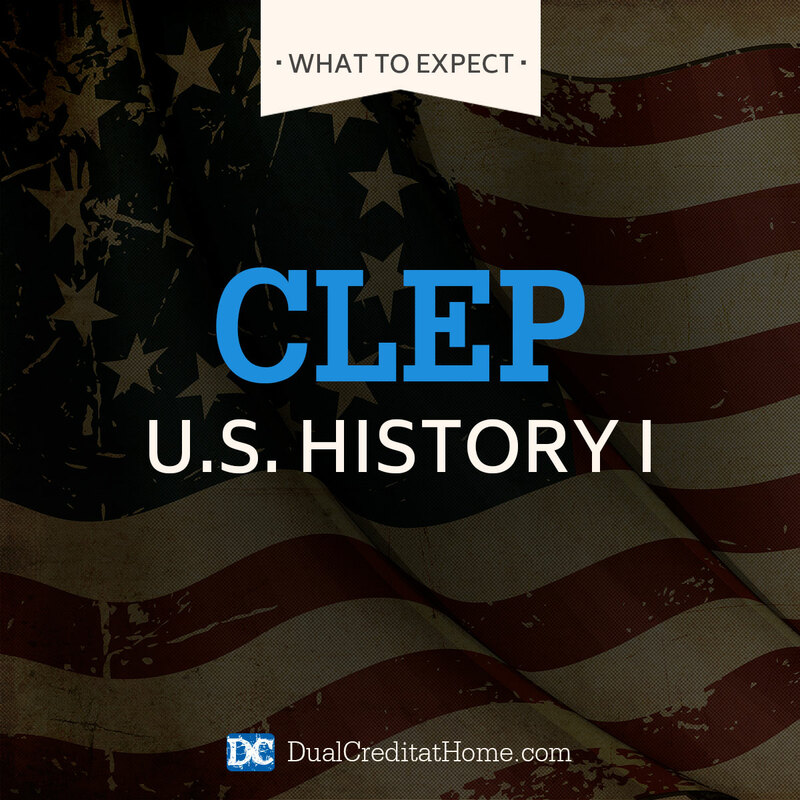 Anyone, especially high school students, who have a strong grasp or interest in history can bypass an expensive college course and take this CLEP exam for credit! The CLEP (College Level Examination Program) tests are a smart, cost-effective way for students, especially homeschooled teens and self-study enthusiasts, to gain college credit without having to sit for a semester or more in a traditional classroom. Keep in mind that European colonization from about 1790 is the beginning period of the U.S. History I CLEP, while the test concludes with questions pertaining to Reconstruction issues until the year 1877. The exam’s highest possible score is 80, but a “passing” grade for credit is set by specific institutions, so test-takers should know beforehand whether they are aiming for a 50, 60 or some other score for the college of their choice. Always check with your preferred institutions to learn about their CLEP policies. Some are more lenient than others, but the huge majority of U.S. colleges and universities allow a wide range of CLEP exam credit to prospective undergraduates. What’s the U.S. History I CLEP Exam Like? For a closer look at the specific content on the U.S. History I CLEP, the College Board (administrators of the CLEP tests) offers a succinct description of the subject breakdown at their site. The unofficial title of the test shows the “big picture” of this challenging exam, “History of the United States: Early Colonization to 1877.” Within those parameters, test-takers should be ready to handle material that is traditionally taught during the first of a typical two-semester college course on the subject. The specific years covered on the exam run from 1790 and European colonization until 1877’s Reconstruction period. While there were non-European colonies in early U.S. history, the CLEP exam for this subject emphasizes European settlers and colonists. Those who sit for this test are allowed 90 minutes to answer 120 multiple-choice questions, as well as a bit of additional time for filling out basic identification data like name and address. The College Board does not provide specific questions to prospective test-takers, of course, but does note that CLEP candidates should be able to “compare and contrast,” “interpret and analyze,” as well as “describe and identity” various historical events and phenomena that took place during the time span in question, 1790-1877. About 60 percent of questions deal with public policy, political developments, political institutions, and social developments, while the rest of the questions examine economic, cultural, intellectual, diplomatic and international topics. Test-takers should also be ready to address a few questions about the run-up to this period, specifically during the years 1500 to 1789, though these questions comprise less than one-third of the exam’s subject matter. Some of the major subjects on the exam may include: European discover, indigenous societies, slavery, and resistance, immigration, important individuals, colonial societies, British relations, religion, the Constitution, the Supreme Court, democracy’s development and growth, political parties, intellectual and artistic expression, literature, nationalism, abolitionism, major wars specifically centered on the Civil War. There are several effective strategies for passing the test on your first try. Remember that history exams like this one tend to be quite specific about dates, names and other related facts. That’s typical for history tests and is especially true in this case. Schedule an exam date and make a written study plan as soon as possible. This way, you’ll have a firm goal and a realistic way of achieving it. A written study schedule allows you to break up the chore into digestible chunks. Need help registering for the exam? This how to register for a CLEP exam guide will help you get started. For those who don’t want to create their own plan, Dual Credit at Home provides written Study Plans that will walk you through this US History I exam. We’ve eliminated all the guesswork of what to study and how to study, so in just five weeks, you can be ready to pass the exam with flying colors! BONUS RESOURCE: Students receive a free U.S. History I CLEP Exam Study Plan with our course, The College Degree Roadmap! Get a free preview of the course to learn how to use CLEP to save time and money! Having someone to run through the material with and to keep you on your schedule is a smart way to up your chance for success. Dual Credit at Home students receive complimentary access to our private Facebook group. You’ll benefit from our community’s ideas, encouragement, tips, and resources. Use exam-specific materials to prepare. At the College Board website, you can find prep material for the exam, which means that you won’t be wasting time on extraneous facts and concepts. Even when doing research online, make certain not to stray from the specific testing topics as outlined by the College Board. With Dual Credit at Home, we’ll provide you with a book list upon enrollment that will tell you the exact books to study, plus give you recommendations for practice tests. Study every day and avoid “cramming” the night before the exam. Even when you can’t fulfill a certain day’s study obligation, try to set aside at least 15 minutes to review important concepts. Research has shown that daily studying is far superior to a few, much longer study sessions. Scheduling: You can register and pay for your exam on the CLEP website. After that, you can contact any of the many CLEP testing centers online and schedule an exam, choose a location to take it, and read about rules that pertain to each testing site. Costs: On the CLEP website, you can register and pay the $87 fee. Note that once you schedule an exam, testing centers might also charge you a fee, typically $25. If you are in the military, testing is free. ACE recommended scores: Raw scores are converted into scaled numerical scores between 20 and 80. Test-takers receive their scores immediately after taking the exam and can check their online account for more information anytime. Semester Hours: Most CLEP tests will earn you 3 standard college credit hours, but check with your preferred college’s website for detailed information about any tests you intend to take. Students who want to earn college credit via CLEP exams, especially on the U.S. History I CLEP, can do so by adhering to a realistic study plan, taking practice tests, and having a positive attitude. Dual Credit at Home can help you get started with taking your first CLEP exam. Our comprehensive online course, The College Degree Roadmap, walks students through the process of earning an accredited associate or bachelor’s degree with the help of CLEP, DSST, and other exam programs. We’ll even give you a free Study Plan for the US History I CLEP! To learn how you can get started, click here get a free preview of the video course.